France in general and Paris in particular are surprisingly bad at doing certain basic necessities. Like pizza. Or coffee. Even when I was a caffeine junkie but not a caffeine geek, it was hard enough to find a double espresso or double mac that wasn't scalded and bitter, let alone an artisanal coffee-based beverage. Knowing the French for macchiato--une noisette--helps, of course. Before my birthday Paris trip on Wednesday, then, I decided to do some quick research and once again, a page on this blog came pretty high in the search results. I did find a few possibilities though (most of them owned by expats) and was able to pay a visit to La Caféothèque (NB their URL isn't currently working) in the 4ème, just north of the Île Saint-Louis. 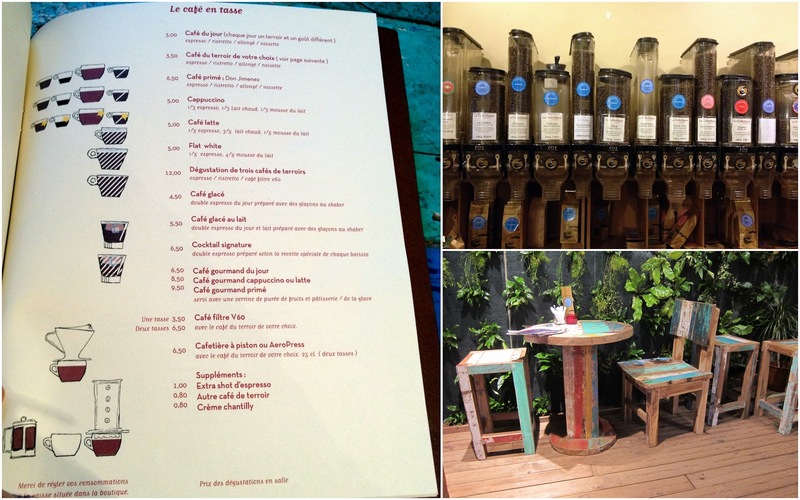 La Caféothèque is a Guatemalan-owned coffee shop, which offers coffee from a huge array of different countries: once you have picked your coffee type, you can pick your vintage. Although the coffee of the day, a Costa Rican blend when we were there, was 50 cents cheaper, I opted for a noisette with one of the Guatemalan coffees. When in a Guatemalan coffee shop... The descriptions on the menu and the fact that there was an illustration of an Aeropress were good signs, and when the coffee arrived a little while later, it was very good. My noisette had slightly more milk than I usually prefer but it still tasted great--the blend I chose was chocolatey, rich and smooth. In short, it looked like a macchiato you might find in London or New York, rather than the usual Parisian offerings. The coffee shop itself turned out to be surprisingly cavernous. Near the entrance is a big roaster, where you can also buy beans or ground coffee to take away, and then you proceed through a labyrinth of rooms, some with comfy armchairs and sofas, some with tables and chairs. It was a quiet Wednesday afternoon so the Mac posse were obviously taking a break, but there seemed to be a mix of tourists and locals. They definitely take their coffee seriously here. About time! There wasn't time on Wednesday but during my research, I found a few other potential venues for quality caffeination in the City of Light: Coutume Café in the 7ème, which I believe is Franco-Australian; Gocce di Caffe in the 2ème; and the American-run Merce and the Muse in the 3ème. Let me know if you've been to any of these places--or any other places for a truly great macchiato in Paris. La Caféothèque. 52 rue de l'Hôtel de Ville, 75004 Paris (Métro: Pont Marie or Saint-Paul). Website (offline at present). Lovely article! Thanks for the share! Looks lovely indeed! Will definitely pay it a visit next time I pass by! I hadn't realised that you'd been to La Caféothèque. It's a lovely little spot, isn't it? Thanks, Brian. Yes, all too long ago -- in the first year of my Caffeine Chronicles reviews! I wish I'd had time to go back last week.